Sage has been a proud member of the North East business community for over 30 years. The region has long been a hotbed of innovation and world class firms. That tradition looks set to continue with the launch of the North East Chamber of Commerce (NECC) 2015 manifesto. The manifesto sets out key lobbying priorities for the region. These aim to help businesses of all sizes by pushing for all manner of positive changes, from reforming property taxation to improving broadband infrastructure. The recession bit hard, but the British economy has bounced back, and is now over three per cent larger than before the crash. According to our own research, business confidence is at a four-year high. However, 52 per cent of small businesses owners believe too much investment is focussed on London and the South East. Signs are looking good for UK companies generally, but in 2015 the North East in particular can shine. 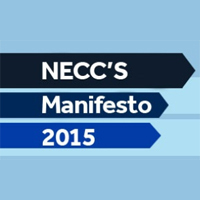 The NECC’s manifesto is a very good starting point on this road. This all-encompassing approach to pushing forward the North East’s business agenda is something everyone in the region should get behind. What’s more, it comes hot on the heels of a very encouraging couple of years – the Government’s commitment to roll-out superfast broadband, upgrading sections of the A1 North, a reduction in stamp duty for 98 per cent of homebuyers; these are all changes that help strengthen the economy. Now roll on 2015.